SAN FRANCISCO, CA--(Marketwired - Oct 8, 2013) - Continuing to develop new mobile webcasting capabilities in recognition of the growing mobile content delivery market trend, ON24, the global leader in webcasting and virtual communication solutions, announced today a new Enterprise Mobile Webcasting initiative to support the enhanced, real-time delivery of mobile-ready content. According to ON24 Chief Product Officer and CTO Jayesh Sahasi, providing an optimized participant experience, regardless of what devices the audience uses, is a core component of ON24's product development strategy. "ON24 enables enterprises to communicate effectively with mobile audiences. We are utilizing HTML5 and mobile access to knock down the walls that exist between people and information, delivering a mobile experience that makes it easy for attendees to access both live and on-demand webcasts from anywhere, at any time and on any device, without the need to install apps or download software." 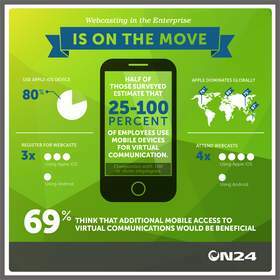 ON24's market data show that mobile webcasting registration and attendance in the enterprise continue to rise. For example, in just the last month, over 30,000 people accessed the ON24 platform from mobile devices. "Mobile adoption is taking off in the enterprise, and so is mobile webcasting. In addition, according to our data, webcast attendance increases more than 10 percent when mobile access is offered -- an automatic and no-cost ROI enhancement," said Sahasi. Another part of these larger trends is audience engagement -- mobile device users are just as engaged as those in front of a computer, or even more so. For example, ON24 data show that mobile webcast viewers ask 20 percent more questions. "Our customers rely on us to help them execute their mobile content delivery strategies. Demand for mobile access to webcasts continues to grow, and ON24 is setting the bar for the mobile experience," added Sahasi. "Mobility is a top priority on our roadmap for 2013 and beyond; all of our product development initiatives take mobile viewing into consideration. Our goal is to bring the best experience to mobile device users, allowing them to enjoy the benefits of webcasting and virtual communications at any time and in any place." Today ON24 is also announcing a new mobile webcasting console. Designed to bring the power of HTML5 to webcast attendees who prefer the convenience of mobile access, the new mobile webcasting console enables producers to deliver webcasts directly to the audience, regardless of location. The console has been optimized for viewing on a smaller screen, giving mobile and tablet viewers a richer webcast viewing experience. Almost half of those surveyed estimate that 25-100 percent of employees use mobile devices for virtual communications. Moreover, 69 percent think that additional mobile access would be beneficial. ON24, the virtual communications platform for the global enterprise, provides interactive, impactful cloud-based solutions that drive outstanding results. ON24 offers a broad and innovative product portfolio, including webcasting, virtual events and virtual environments, accessible from any device and supported by robust reporting and analytics. Applications for the ON24 platform include demand generation, partner enablement, virtual talent onboarding and development, product launches, company town hall meetings and user conferences. More than 800 organizations, including IBM, CA Technologies, Merck, Unilever, JPMorgan Chase, Deloitte, Credit Suisse, Ernst & Young, Amazon and SAP, rely on ON24. The company is headquartered in San Francisco, with offices throughout the world. For more information, visit: http://www.ON24.com. Demand for Enterprise Mobile Webcasting is significant--and growing.